Whether you work with more buyers than sellers or more sellers than buyers, consumers need the best advice when securing a new mortgage. Statistically, many consumers ask their Real Estate Agent for this advice…which leads to the purpose of this letter. 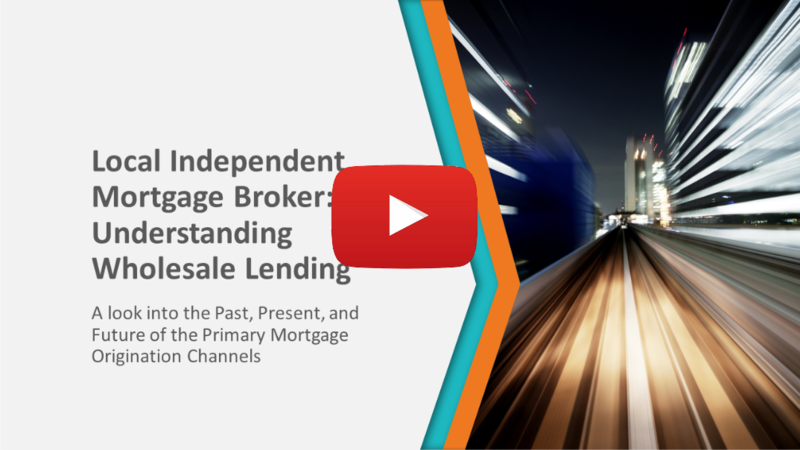 Approximately 90% of Mortgage Loan Originators in Oregon and Washington State are employed by, selling, and steering only One Lender. This lack of independence creates a conflict of interest to the client they are hired to represent and they lose control of options as it pertains to programs, rate sheets, turn-times and closings. Lower rates and fees with lender credits available for your clients. This results in more competitive offers and happier clients for your referral. One of the most experienced teams in the country, right here in the NW. Access to the best and largest banks and non-banks, competing for your clients and not one random lender being sold by their employee. Access to agency-direct investors allowing for no overlays and more reliable loan approvals. Produce early CDs, table fund, execute closings. VMG is nationally recognized and one of the highest client-rated providers locally-owned in the Pacific NW. All loan processing controlled in-house from application to closing. Supports local small business versus corporate special interests. We know how important it is that our client’s experience a smooth and informative transaction when buying or selling real estate. Having choices and the support of a team working hard on their behalf significantly increases the likelihood of referrals and the improved reputation for each team member involved. 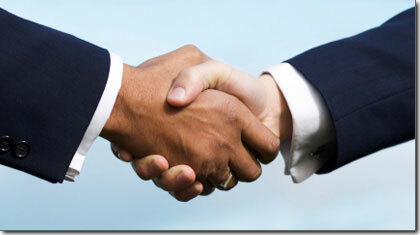 We strive in developing business relationships that THRIVE. While the mortgage process may appear similar to most, not all mortgage providers are created equal. At Vantage Mortgage Group our goal is simple: Provide more qualified representation and better execution at a lower cost. 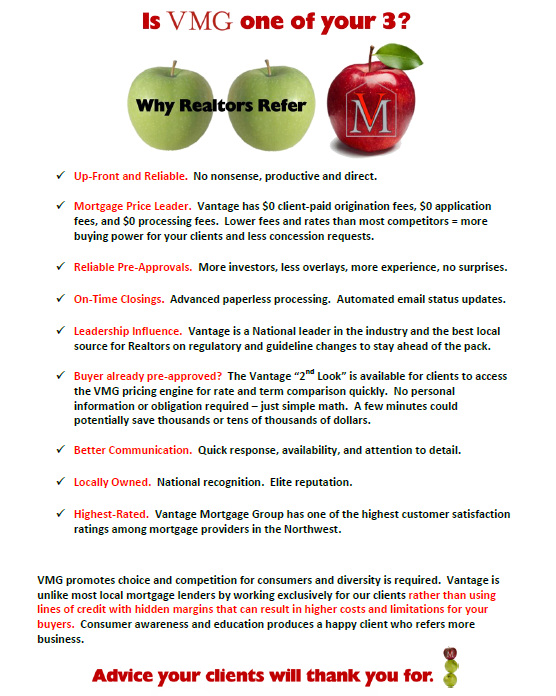 The ability to potentially save your clients thousands of dollars on their mortgage by including Vantage in your lender referral group can result in more referrals. They will remember it and appreciate you for it. We don’t use sales tactics to avoid full-disclosure and education. We use education and full-disclosure to close more sales. We earn business by reputation and competition, not by compensation and premonition. No clicks, no affiliations, no “joint ventures”, no steering. Hard work and in-depth experience to improve the industry and the outcome to our clients. Excellent Service is required. Excellent Pricing is acquired. Less overhead and more closings = better pricing and investor relationships. Locally owned and operated. Elite reputation with advanced paperless systems. Manual and automated updates and communication, with immediate response and local availability at all times. Our clients speak for us. We publicly and proudly share feedback and testimonials from our clients and business partners. The most experienced Mortgage Professionals in the Northwest. Vantage leadership is heavily involved in all regulatory and operational changes in the residential primary mortgage market. If you are interested in business partnership with Vantage Mortgage Group or if you would like to schedule a meeting, please contact us directly. 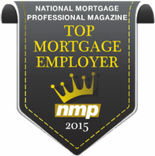 Voted one of the Top 20 Mortgage employers (Northwest U.S.) by National Mortgage Professional Magazine.